What do all these have in common: falling leaves, hoodies, carving a pumpkin, corn stalks, decorating, apples? Of course! It’s fall. My favorite time of the year. 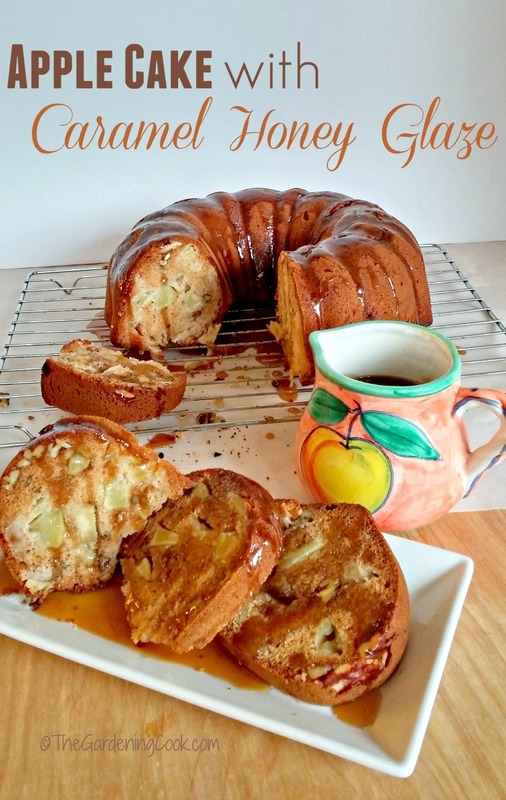 And what could make it more perfect than this honey apple cake with its delicious caramel honey glaze? It’s a keeper! 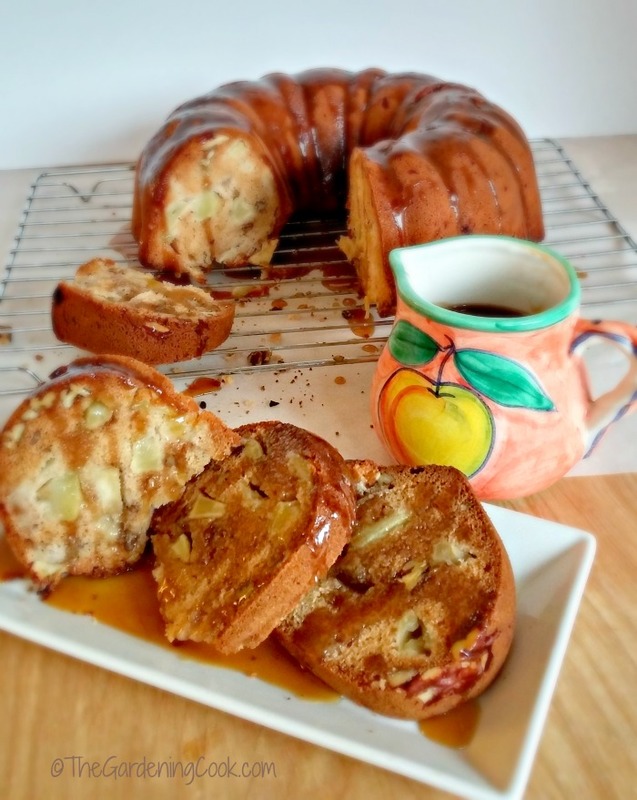 Make the most of fall by treating your family to apple cake with caramel honey glaze. This apple cake is the perfect way to usher in fall. It’s the best time of the year to purchase apples in all their perfect crunchiness, and the prices are good too. Win, win as they say. 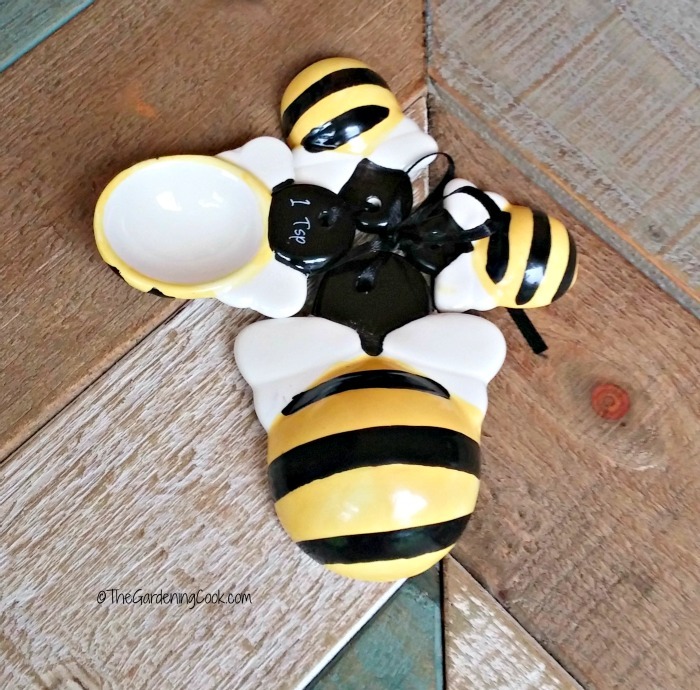 In my insightful moments, I sometimes finding myself wondering who ever saw a bunch of bees buzzing around a bee hive and thought, “I bet that is full of something sticky and really good to eat?” But I digress…. I’m just admiring my new bee measuring spoons and got wondering all sorts of bee and honey stuff, and forgot that I had to bake a cake! Dontcha just love my little bees? Kind of perfect for this recipe, huh? I have just come across a super new product by Tate+Lyle®. They make Honey Granules. This nifty bag is full of tiny, sweet granules that are perfect to sprinkle into your tea, or cereal. They make an easy to measure alternative when you are looking for the delicious honey flavor, but don’t want the bother of a sticky mess. They are free flowing, not liquid, which make them so easy to use. The granules can be used for cooking, baking, or for sweetening beverages, like teas and smoothies. These granules are perfect to use for the glaze for this cake. I love that I can make it on the stove and that there is no sticky mess involved when I mix all the ingredients for the glaze together. It is a perfect choice for anyone who loves the flavor of honey in an easy to use bag of granules that pours beautifully. I’m going to use a bundt pan for this recipe. Those creases in the cake when it was done make the perfect down hill raceways for the oodles of glaze that I plan to drizzle over it. 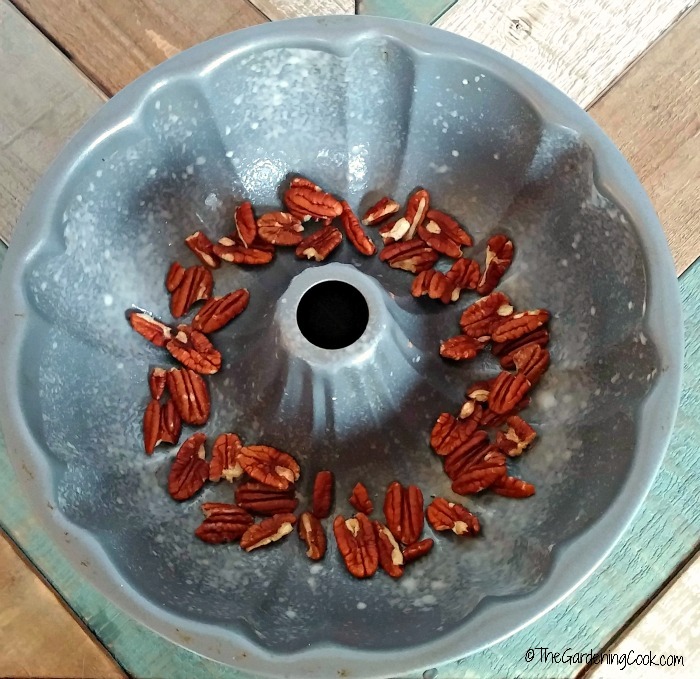 So start by greasing and flouring the pan, and then put your 1/3 cup of your crunchy pecans in the bottom. ( I left these whole but coarsely chopped the ones that go in the cake.) When the cake cooks, you get a nice layer of pecans on the top that blend just beautifully with the caramel honey glaze. I used my stand mixer to beat all the wet ingredients for the cake. A hand mixer will do too but the batter is pretty thick so it will be harder to mix that way. By the way, if you don’t have a stand mixer and like to bake, consider getting one. I use mine all the time and it makes cake making a cinch. And anything that makes my kitchen tasks a cinch is good in my book. I gave it to myself a few years ago for a Christmas present and just love it! The dry ingredients come next and then the apples and rest of the pecans are folded in to make a thick batter. Will power…ah yes. I’ll warn you. This is the BEST tasting batter I have ever had the opportunity to lick off my beaters. The problem now is not eating it before I actually cook the cake! I’m kind of tempted to freeze it and make it into apple cake dough ice cream. But now…back to reality and into the oven for 55-60 minutes. Now it’s time to use the Tate+Lyle® Honey Granules. Yay! I love trying new things and am excited to see how the granules work for my glaze. They are simple to use. Just place the brown sugar, butter and granules along with a bit of apple juice and milk into a saucepan and bring it to a boil. Lower the heat and continue cooking for another few minutes, being sure to stir the whole time. Let it cool just a little and then pour it over the cake while it is still warm. This cake is something else. As in, have to get it out of the house, OR I WILL EAT IT ALL something else. The flavor of the cake on its own is delicious, but add that scrumptious caramel honey glaze over it, and you’ll be tempted to eat more than one slice. I promise! WHOA. It seems like I got a little crazy with the glaze there. My pants will scream at me tomorrow, but it sure feels good tonight! The glaze is hard to describe. It has a taste similar to wrapped caramels with just the extra touch of honey. SOOOOOO good! Please let me know what delicious treat you cooked up using the granules. Share, share in the comments below! And now that I have come to my senses, I am going to go portion that cake and freeze some of it…while I still have some will power left! Love bundt cakes? 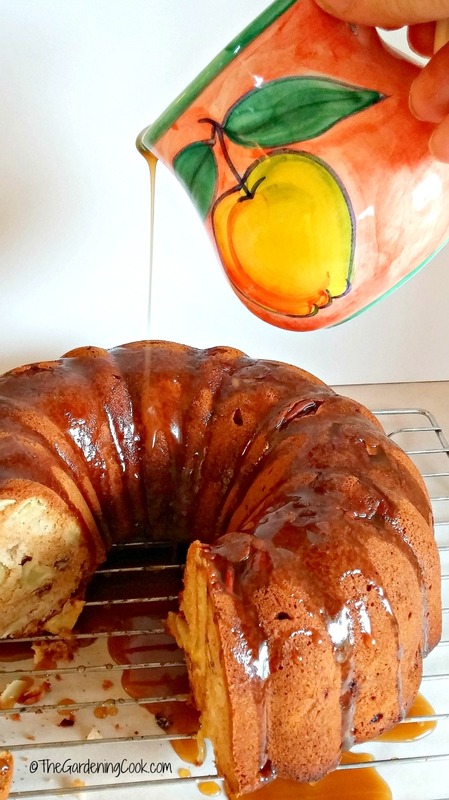 Try this orange bundt cake with a citrus glaze. ¼ cup Tate+Lyle® Honey Granules + 1 tbsp apple juice to recipe. In the bowl of a stand mixer, beat the sugar, canola oil, honey and pure vanilla extract on medium speed until everything is well blended. Add the eggs, one at a time and then beat again until well combined. In separate bowl combine the flour, baking soda, salt, cinnamon and nutmeg. Whisk the ingredients to combine well. Add the flour mixture to the sugar and egg mixture and beat on medium speed until well blended. 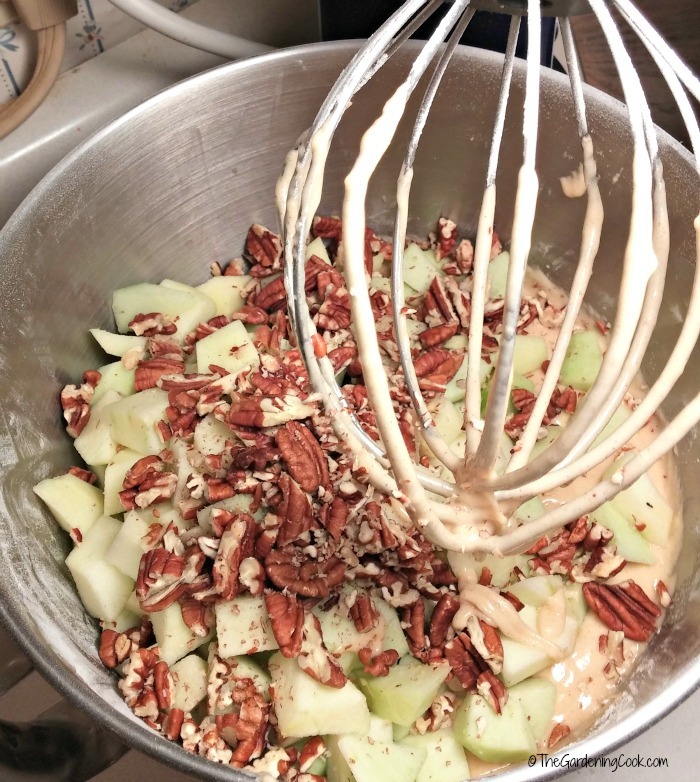 Stir in apples and the remaining pecans (I chopped these coarsely.) The batter will be quite thick. Pour it into the bundt pan and bake for 55-60 minutes. Let the cake sit for a few minutes in the pan, then remove and cool on a wire rack for about 15 minutes. While the cake is cooling, prepare the honey granule drizzle. Place the ingredients in a large sauce pan and bring to a boil. Stir constantly for 2 minutes. Let it cool just a little and then pour it, while still warm over the cake. I bet that smelled so good baking that you couldn’t wait for it to come out of the oven. LOL… I hear you when you say you had to get out of the house before you ate it all. OH MY GOD.THIS LOOKS SO DELISIOUS.I WILL DEFINATLY TRY THIS CAKE AS SOON AS I CAN. This cake looks and sounds delicious. I look forward to trying this recipe. We are going apple picking tomorrow so this is right on time. Thanks for sharing. Your cake is full of all of my favorite things. I could eat that entire bowl of batter. I’m all about apples in the fall and this is my kind of cake. Looks amazing. I must admit. It was hard not to eat the batter before I cooked it. SOOOO good. This looks soooo divine. 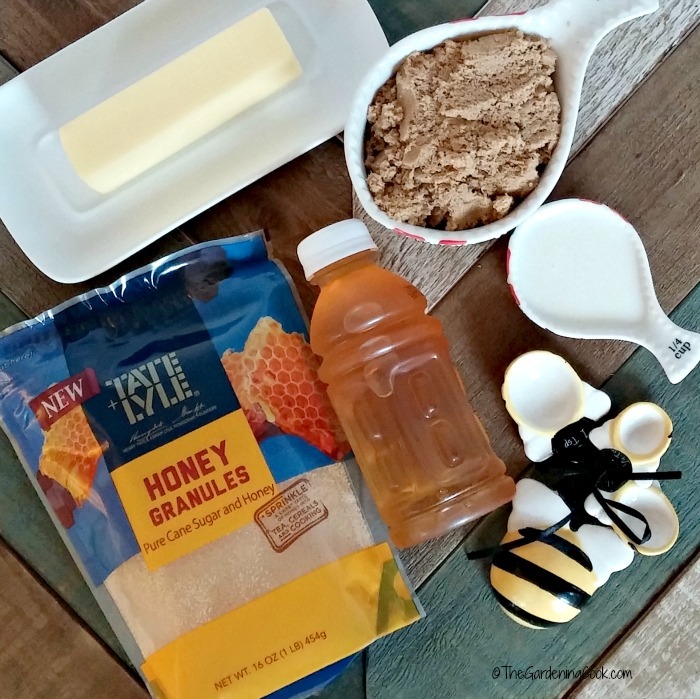 I love the idea of cooking with honey instead of so much white sugar – and I love that this behaves like regular sugar! It was the first time I had tried the granules and love the way they work. Oh man that looks so good. I don’t bake as much as I should but now that I’ve seen this I think I want to give this a try because I’m sure it was just as good as it looks. Best cake I have made in a long, long time! That cake looks decadent. Not to mention that glaze!!! Yum yum yum! The glaze really is to die for! This looks amazing! I have not heard of these granules before, what a perfect recipe to use them in. I wondered how they would work in a glaze, but they were perfect, and it tastes delicious! OMG this looks delicious and actually really simple to make! I can’t wait to try it. It is pretty easy. The glaze just need stirring but other than that it’s straight forward. Hope you enjoy it if you try it. You need to teach cooking/baking classes. I would seriously attend. This looks AM-AZZZZ-INGG! Wow, I love the big chunks of apples inside, what a special treat! My husband nd son would absolutely love this! Those apples really add a special texture to the cake. This looks like the most perfect fall treat! Honey and apples just make a great pair. I need one of these special cake pans because the cake comes out so beautifully in this style. Wish list item! I love cooking in bundt pans for that reason too! That cake looks so yummy! 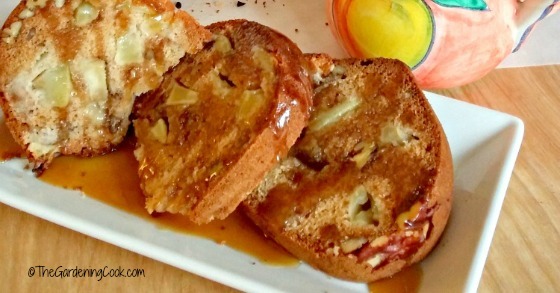 I love apple anything in the fall, can’t wait to try this recipe! Let me know how you like it when you try it Megan. We really loved the taste. This sounds wonderful! 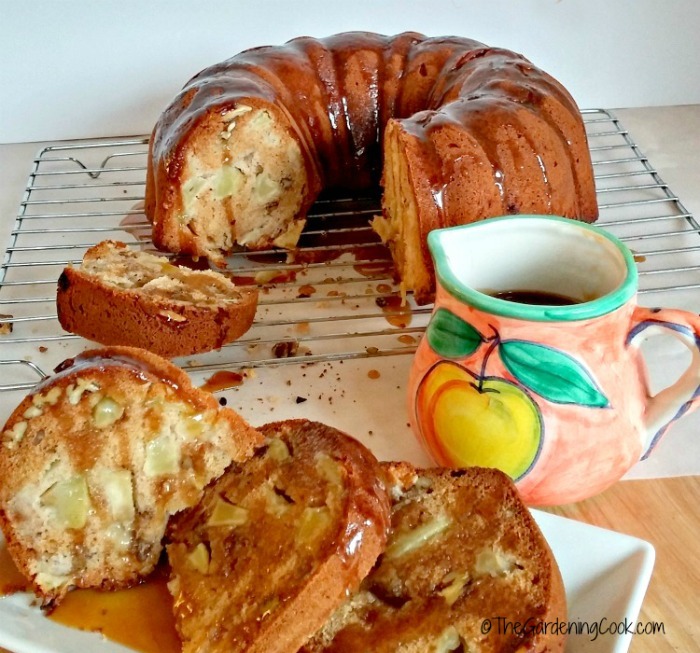 Apples and pecans in the same cake, plus honey? Sold! Thanks for pinning it Stacey!